Temperance represents the alchemist each person holds within who constantly blends and adjusts all of the facets of life. Temperance is the mediator between outer consciousness and inner self, the flowing of the past and future. She is never hectic, always reaching from the composure of her inner calm. She calls together and integrates opposites in appropriate proportions. 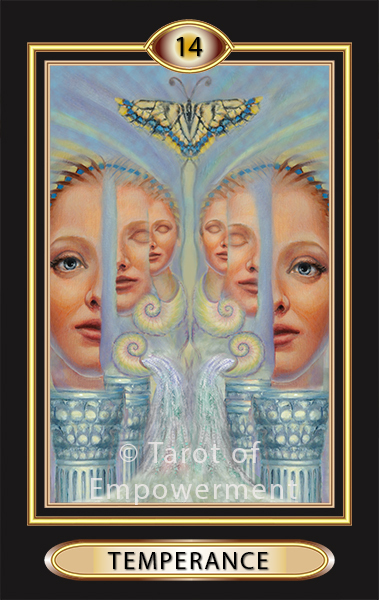 In the Tarot of Empowerment, the Temperance card shows the split and the merging of the many facets and responsibilities one has in life. The woman is depicted moving from the conscious to the subconscious and the intuitive as she maintains equilibrium. The pillars represent the transition to the sacred and the unknown, while the nautilus symbolizes the ever increasing spiritual evolution. Transformation is represented by the butterfly. The water reminds us of flow and healing powers of spirit in our lives. Upright: When Temperance comes up in your life, it’s important to acknowledge, honor and balance all of the roles you play in your life. Balance does not imply all parts are given equal attention. Like making a stew, ingredients are added in different proportions in order to make a well balanced, wonderful whole. In a like manner, at one stage of your evolution, you will give more energy to one life role over another. Only you can make necessary adjustments when needed to become balanced. Empowerment: Be willing to accept your own needs by acknowledging, honoring and bringing into balance all aspects in your life. Reversed: Try to find the balance within through quiet practice and by paying attention to what you need to bring peach to your life. As a block, reversed Temperance suggests you lost equilibrium among the many roles you have in life. Observe yourself, and discover which aspect of yourself you are neglecting. Numerology: Temperance has been assigned the number 14, which reduces to 5. The number 5 represents change and options. The Advisor is the other card that is a number 5.